 Matthew 3:13-17: For details see notes in Nazarene Commentary 2000 on Matthew. Mark 1:9-11: For details see notes in Nazarene Commentary 2000 on Mark. Jesus also was baptized: Luke does not mean Jesus was baptized among a throng, but that during this period Jesus came privately to John to be baptized. The crowds were not to witness the anointing of Messiah. About thirty years old: Either he was about to turn 30 or had recently turned 30. The son of Joseph: As far as most people were concerned Joseph was the father of Jesus. Clearly the One Who does not tell lies confirms the position of the man in the water, who was baptised by John the Baptist. 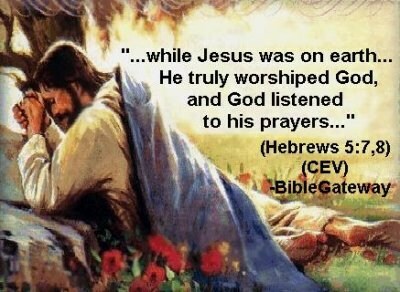 Many who witnessed this occasion heard also the voice of God, who said Jesus was His “Beloved son“. God did not say “This is me”. God, Who is a Spirit and has no blood, no flesh and no bones, can not be seen by man or they would die. Jesus was seen by many, and had flesh, blood and bones. Great expectation: Or, suspense, on tiptoe. There was a strong messianic spirit of anticipation at the beginning of the 1st Century. Compare Luke 19:11. I am not worthy: For details see notes in Nazarene Commentary 2000 on Mark 1:7. Baptize you with holy Pneuma: For details see notes in Nazarene Commentary 2000 on spirit baptism compare 1 Corinthians 12:12, 13. Rather than being something positive for Christ’s followers, the baptism by fire is the judgment for the unbelievers, with the unbelievers represented by “chaff” in that verse. Chaff is the dry, scaly, inedible casing of seed or grain. Before the invention of the threshing machine in the latter part of the 18th century, threshing was often done by placing the sheaves on the threshing floor and beating them or running over them. It was the most labor intensive part of the harvest. Afterward, the wheat would be separated by winnowing, often done with a winnowing fork by tossing the grain into the wind so that the chaff would be blown away. The chaff was often burned then to dispose of it. In the gospel accounts all of John’s words (except the word against Antipas) are spoken to persons seeking this baptism. His words show that John was unreceptive to those whom he judged to have bad faith, while he was friendly to those who were truly repentant. To the former he repeated threats and warnings and perhaps added new ones, while to the latter he gave hope for further dramatic renewal of their lives as well as ethical guidance relevant to their particular vocations. The former group seems to have been made up of people whose commonality was lording power over the common people: the religious leadership, the wealthy, the tax collectors and soldiers. The Pharisees and Sadducees are warned that mere ritual is inadequate and will not preserve them from God’s wrath. Rather they must do good deeds that are appropriate to genuine repentance in view of the coming kingdom. Producing fruit as a metaphor for a repentant lifestyle occurs elsewhere in Matthew (3:10; 7:16–20; 12:33; 13:8, 23, 26; 21:19) and is common in the OT (Ps 1:3; Isa 3:10; 5:1–7; Hos 10:1). The image of Israel as the tree from which fruit is expected echoes Hosea 9:16; Isaiah 27:6; Jeremiah 12:2, 17:8; and Ezekiel 17:8-9, 23. Matthew 3:12 winnowing fan… threshing floor…gather his wheat into his barn, but the chaff he will burn: The discrimination between the good and the bad is compared to the procedure by which a farmer separates wheat and chaff. The winnowing fan was a forklike shovel with which the threshed wheat was thrown into the air. The kernels fell to the ground; the light chaff, blown off by the wind, was gathered and burned up. The scene echoes OT passages such as Ps 1:4; Prov 20:26; Isa 41:14–16; Jer 15:7; 51:33; Dan 2:35; Hos 6:11; 13:3; Joel 3:13; and Mic 4:12–13. His shovel is ready in his hand, to winnow His threshing-floor and gather the wheat into His granary; but He will burn the chaff on a fire that can never go out.” John was revealing Jesus. As we repent behavior that is unacceptable to God, the thoughts that preceded that behavior are cleansed via a purifying fire, and washed away with our Holy Baptism. Once cleansed, we each have the opportunity to start anew, never to commit that sin again. John’s baptism differed from sacramental Baptism, which confers forgiveness and the regenerating grace of justifying faith (Acts 2:38). His was a visible token of repentance and preparation for the Messiah (cf. Is 1:16; Heb9:10; CCC 718). with fire: A symbol of God and his purifying judgment (Deut 4:24; Sir 2:5; Is 4:3-5; Acts 2:3-4; CCC 696). Don’t just say to each other, ‘We’re safe, for we are descendants of Abraham.’ That means nothing, for I tell you, God can create children of Abraham from these very stones.10 Even now the ax of God’s judgment is poised, ready to sever the roots of the trees. Yes, every tree that does not produce good fruit will be chopped down and thrown into the fire. “His winnowing fork (used in harvesting) is in his hands to clear his threshing floor, and to gather the wheat into his barn, but the chaff he will burn with unquenchable fire.” [v.17] Chaff are ears of wheat that are useless, they have failed to produce; how much chaff can God see in the world today!! Let us make sure we are not among the chaff! Let us all “bear good fruit” for John also preached, “Every tree therefore that does not bear good fruit is cut down and thrown into the fire.”[v.9] Bearing good fruit should – indeed – must be – a labour of love for our Lord – before the harvest time occurs. What wonders then follow! The Son of God: Now recognized as not adequately supported. Baptize you with the holy Pneuma: On the holy Pneuma see notes on 1 Corinthians 2:16 and 1 Corinthians 12:13. Something very significant is happening here on the banks of the Jordan River where we find John the Baptist and Jesus together. In Mark’s gospel, the oldest of the four, this text is the opening event. All four gospel writers place the story at or near the beginning of their work, and in each case, it precedes their account of the public ministry of Jesus. In Matthew’s account of Jesus’ baptism, we find that all authority in heaven and on earth is given to Jesus through the dove that alights on him and the voice that speaks from heaven. …then consider that discomfort God’s signature move. Perhaps its that to him things seemed to be turned upside down, inside out and backwards, that Jesus is there submitting before John to be baptized. And maybe that’s what seems to bother John and and maybe us too the most. And so we try to bring order to that chaos we feel…those moments that don’t make sense. And maybe its all John can do to hold back when he wants to switch places with Jesus. This is my beloved Son: this was the first few words that was uttered after Christ’s baptism. Much more, as followers of Christ that has been ransomed by his blood. Immediately after our baptism, the gate of heaven open down to us paralleling the way Heaven opened when Jesus stepped out of the water and the Holy Spirit is being outpoured into our life and we become instantly renewed.So, baptism for us Christians is a day of joy for we are adorned anew with a holy attire, the one we should preserve jealously till death(pure as white as snow before God),so, praises should not be found wanting on our lips. You can make it 3 weeks without food, though we promise you that won’t be fun. But after only 3 days, you need water or you’ll perish. Jesus does not need this baptism. He has no need for forgiveness. He has nothing to repent of. Jesus comes to the baptismal waters of the Jordan fully righteous, perfect, without blemish or spot or stain.Yet Jesus comes to these waters loaded down with sin – “…the sin of the world…” as John put it. That’s why Jesus is here, to fully be a sinner with us. There is no distance between us and Christ, no separation. In His baptism, Christ makes Himself completely one with us. What John saw as necessary separation – sinner’s baptism only for sinners – Jesus gently puts aside and says “it is fitting for us…”Jesus’ Baptism is our Baptism. It is not the water that does it – it’s no mere water – but it’s the Word in and with the water that makes this Baptism. That is, it’s Jesus there in the water – being sinner for you – that makes it. Titles can build up and break down. Titles are the building blocks of our social world. You ask someone who they are, or you say Tell me about yourself and they’ll give you titles. It’s our default response. My name’s Jared and I’m a minister, a student, a brother, a son, a fan of this that and the other thing. Titles are so important that we rarely reflect on their importance. But it’s a telling if you do. You know the word vulnerable actually from a latin word which means to be wounded, so to be vulnerable, means allowing yourself to be wounded. It means recognizing that you don’t have it together, that you are broken, you are wounded. Being vulnerable is a courageous act. As we go to the water we forget the myth that we are perfect, that we have it all together, and we let our tears rise, and let our chin quiver on the shoulder of the one who created us.Jesus knew what it meant to be wounded. Throughout his life, he had a knack for finding the most broken hearted people in a community, whether they were full of disappointment, or shame, or in deep grief. He would seek them out, and spend time with them, learned what they were most vulnerable about and would meet them there in their vulnerability. MT3:1 But in those days John the Baptist came from the Judean wilderness, MT3:2 preaching, “Repent for the Realm of Heaven has drawn near. MT3:3 For this is the One spoken of by Isaiah the prophet, saying, ‘A voice of one crying out in the wilderness, “Make ready the Way of YHWH – make straight His roads.”’” [Isaiah 40:3] MT3:4 But this John dressed in camel’s hair with a leather belt around his waist and hips. His food was locusts and wild honey. MT3:5 Then Jerusalem and all the Judeans and all the country along the Jordan came to John, MT3:6 and they publicly confessed their sins and John baptized them in the Jordan river. Those days: Luke gives the precise timing by paralleling these activities with several contemporary rulers and priests (Luke 3:1ff). It was the year 29 AD. John the Baptist: The prophet from the desert is mentioned 150 times in the Christian Bible. The name “John” means “Yah Favors.” Jesus ranks him equal to any of the greatest people in the Bible (Matthew 11:11, 12). Jesus compares him to the prophet Elijah. Wilderness: BER: the Judean desert. Repent: Repentance is a key word in the Bible. It means to “change the mind” or “feel sorry” for sins. The word group occurs 70 times in the Bible with the first at Job 42:6 and most often in Luke, with Revelation second. John’s call to repentance was regarding sins against the Mosaic Law. Realm: The Greek is BASILEIA and is often translated “kingdom.” MOF: Reign of heaven. The word occurs 366 times, first at Genesis 10:10 and most often in Daniel and then Matthew. The word may mean the seat of government, that is the king, or source of the authority. It may also mean the realm, territory or domain of the King. Here John has in mind the future manifestation or appearance of the Messiah Jesus, the “king of Israel.” “Kingdom of heaven” (Matthew) or “kingdom of God” (Luke) is used most often by the Nazarene to mean the “realm of profession” or the Church (Compare the parables in Matthew 13). Near: Usually the word “near” means within hours or days. John has in mind the coming of Messiah as the future King of Israel. Isaiah: The quote is from Isaiah 40:3 and leans toward the LXX though paraphrases a bit. Locusts: A common food of Middle Eastern nomads. GDSP: dried locusts; BECK: grasshoppers. John is very austere if not ascetic. All the Judeans: John’s preaching has a wide impact among the Jews. Their sins: That is sins against the Mosaic Law. These are all Jews. Baptized: The word (BAPTIZONTO) means “immerse” or “submerge” (RHM) and always occurs where there is “a large body of water.” The word group occurs over 100 times. There are two water baptisms in the Christian Bible: that of John the Baptist for Jews (Acts 18:25; 19:3) and Christian baptism into Nazarene discipleship. “Baptism” is connected to salvation (1 Peter 3:21). There is a baptism into God’s spirit (1 Corinthians 12:13; John 3:3-5). There is a baptism into Christ’s leadership (1 Corinthians 10:2). There is a baptism into the life course as a disciple (Mark 10:38). There is a baptism into death (Luke 12:38; Romans 6:4; Colossians 2:12). Baptism is a fundamental teaching (Hebrews 6:2). Jesus commanded his eleven apostles to go and baptize people of all nations (Matthew 28:18, 19). 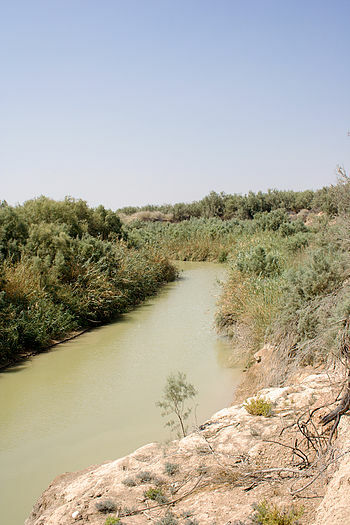 Jordan river: To this day many pilgrims journey to be baptized in the Jordan. To the people of the Old Testament period, the word would mean to turn, to return. Their experience of being in exile in Babylon and returning to Jerusalem was a powerful cultural memory to them. When “repent” was translated from the Greek, another meaning emerged: “to go beyond the mind that we have.” So repentance is all about change, to go beyond where we are and open ourselves to transformation. The Gospel of Matthew: The Messiah of Promise 3:1-12 (anchorlongbeach.wordpress.com)John the Baptist came at the beginning of Jesus’ ministry, which Mark notes as the first words of his gospel. Luke, marks the time with his announcement (“15th year of the reign of Tiberius Caesar,” which puts it around 26 A.D. making both John and Jesus around 30 (See Luke 3:23), but all four gospels discuss this event in Jesus’ life, because it is an important fulfillments of prophecy about the Messiah (See Matthew 11:9-10 cf. Malachi 3:1). The fact that John the Baptist came “preaching in the desert,” is significant, because the desert was a place that God had called His people out from to worship Him, and it was usually represented renewal. Although the Greek word for “Repentance” is Metanoia, which carries the idea of a changed mind, theologian D.A. Carson writes; “What is meant is not merely intellectual change of mind or more grief, still less doing penance…but a radical transformation of the entire person, a fundamental turnaround involving mind and action and including overtones of grief, which results in ‘fruit in keeping with repentance.’”Now, John’s baptism, was preparing “the way” for those to come to Jesus, but as we see elsewhere, it was only after Christ was raised from the dead that repentance led to the transformation of the Holy Spirit (See Point #5 cf. Acts13: 24ff; 19:4-6). We know that the person John is talking about is Jesus, but Craddock notes, “the narrative asks us to exercise restraint and let the story unfold in its own time.” We’ll get to Jesus soon enough. John simply says in verse 11, “he who is coming after me” and “I am not worthy to carry his sandals.” If you’ve heard the story before we know who is to come. But when it comes to the church, how many times to we assume that everyone knows the story. We assume people know about God’s love made known in Jesus Christ; we assume they know the story of his birth. We assume because we know. But that isn’t the case. We still have to prepare the way of the Lord. John’s Baptism.“to lead righteous lives, to practice justice toward their fellows and piety towards God, and so doing join in baptism” John’s baptism was a symbolic act that people who had already done these things – or were committed to living as such – were forming a “faithful remnant” of the covenant. In the gospel accounts all of John’s words (except the word against Antipas) are spoken to persons seeking this baptism. His words show that John was unreceptive to those whom he judged to have bad faith, while he was friendly to those who were truly repentant. To the former he repeated threats and warnings and perhaps added new ones, while to the latter he gave hope for further dramatic renewal of their lives as well as ethical guidance relevant to their particular vocations. The former group seems to have been made up of people whose commonality was lording power over the common people: the religious leadership, the wealthy, the tax collectors and soldiers. It seems only right that we ask questions about the meaning of baptism since John the Baptist himself asked such questions. Wesley comes down on the side of interpreting Jesus’ baptism as a model for his followers. Jesus was baptized even though he had no sin and required no repentance, which were key aspects of John’s baptismal message. Jesus did this to set a model for us. For Wesley the baptism of Jesus is an example of the obligations that rest on us as Christians for no other reason than Jesus Christ commands us to observe them. If we reject the command, Wesley argues, we should not expect the Holy Spirit. The writer of The Baptism of the Lord (newevangelizers.com) asks his readers to notice that as the Spirit descends upon Jesus, “the Father announces from heaven that this is His beloved Son.”But than straight ahead continues giving the impression that this Voice from the clouds did not tell the truth and gave “a majestic revelation of the Most Holy Trinity, one God in three persons. ” and as such going against all the sayings of Jehovah God and of Jesus himself later in his life when he spoke about his relationship with his heavenly Father. We wonder where Sermo Dei: Baptism of Our Lord (daringlutheran.net) gets it from that the Son of God is incarnate. He does not allow people to question his saying, so this will leave a blank. Though he seem to recognise the Voice of God or the Logos being able to create or to destroy things he suddenly seem to mix the voice of the Creator with the person of which the Logos gave existence of. judgment is there for those who oppose God’s ways, but fundamentally, God wants to bring us back from sin into His ways. We have the image of the Old Testament prophet, whose job it was to preach judgment and punishment to warn the people of the consequences of their continued sin, but God wants most of all as Ezekiel says, for people to turn and live. Father in heaven, at the baptism of Jesus in the River Jordan you proclaimed him your beloved Son and anointed him with the Holy Spirit. Grant that all who are baptized into his name may keep the covenant they have made, and boldly confess him as Lord and Savior, who with you and the Holy Spirit lives and reigns, One God, in glory everlasting. Amen. We could say a lot of things about baptism because there are billions of Christians and thousands of Christian traditions, so baptism can take on any number of meanings and people think about it in a lot of different ways. Matthew 3:1 in those days: This is an OT expression that marks the beginning of the new period, not necessarily a precise indication of time (see Mt 13:1; 24:22, 29, 36; 26:29). Here it marks the time-shift from the infancy narrative to the adult Jesus’ appearance. the desert of Judea: wilderness would perhaps be the better word for modern English. The area is the barren region west of the Dead Sea extending up the Jordan valley. Matthew 3:2 Repent: the biblical idea of repentance involves a willingness to turn one’s life around in the sense of a complete re-orientation. the kingdom of heaven is at hand: “heaven” (literally, “the heavens”) is a substitute for the name “God” that was avoided by devout Jews of the time out of reverence. The expression “the kingdom of heaven” occurs only in the gospel of Matthew. It means the effective rule of God over his people. In its fullness it includes not only human obedience to God’s word, but the triumph of God over physical evils, supremely over death. In the expectation found in Jewish apocalyptic, the kingdom was to be ushered in by a judgment in which sinners would be condemned and perish, an expectation shared by the Baptist. This was modified in Christian understanding where the kingdom was seen as being established in stages, culminating with the parousia of Jesus. 1 Indeed, O Theophilus, I made the first report concerning all things which Yahshua began both to do and to teach, 2 until the day He was taken up, having given directions to the apostles whom He elected, through the Holy Spirit, 3 Those who also to whom He revealed Himself while alive after He had suffered. With numerous signs for forty days He was being seen by them, and He spoke concerning the Kingdom of Yahweh. 6 Then, indeed, coming together they questioned Him, saying, Master, do You restore the kingdom to Israel at this time? power, and you will be witnesses of Me both in Jerusalem, and in all Judea, and Samaria, and to the end of the earth. 9 And saying these things, as they looked on, He was taken up in a cloud and He was hidden from their sight. 10 And as they were intently looking into the heaven, He having gone, even behold, two men in white clothing stood by them, 11 who also said, Men, Galileans, why do you stand looking up to the heaven? This Yahshua who was taken up from you to heaven, likewise He will come just as you have seen Him who ascended into heaven. of Yahshua, and with His brothers. 15 And in these days, standing up in the middle of the disciples, (and the number of names together being about a hundred and twenty), Peter said, 16 Men, brothers, it was necessary for this Scripture to be fulfilled which the Holy Spirit spoke before through David’s mouth concerning Judas, the one having become guide to those seizing Yahshua; 17 for he was numbered with us, and obtained a portion of this ministry. 18 This is he who obtained a field for himself from the reward of sin and fell upon his face on the ground and burst from his middle and poured out all his insides. 19 And it became known to all those living in Jerusalem, so as that field to be called in their own dialect, Akeldama, that is, Field of Blood. 20 Let his dwelling be desolate, and let not one be a dweller in it, and let another take his office. (Psalm 69:25; Psalm 109:8) 21 Therefore, it is right that men being together with us all the time in which the Master Yahshua came in and went out among us, 22 beginning from the baptism of John until the day when He was taken from us, one of these to become a witness of His resurrection with us. 23 And they set out two: Joseph, he being called Barsabas, who was surnamed Justus, and Matthias. 24 And having prayed, they said, You, Master, knower of all hearts, show which one You chose from these two, 25 That he may receive a portion of the ministry and apostleship, from which Judas departed, that he might go to in his place. 26 And they gave their lots. And the lot fell on Matthias; and he was numbered with the eleven apostles. The fifth book of the New Testament, the Acts of the Apostles, records the beginnings of the Christian church under the leadership of the people Jesus had appointed. Some scholars have suggested that this book could also be called the Acts of the Holy Spirit, because the Spirit’s power supplied courage for the apostles in the face of every hardship. Just before Jesus was taken up into heaven, He told the ones He had chosen: “You shall receive power when the Holy Spirit has come upon you; and you shall be witnesses to Me in Jerusalem, and in all Judea and Samaria, and to the end of the earth” (Acts 1:8). With those words, one chapter in the story of God’s work on earth ended, and a new one began. We are a part of that ongoing story. The Holy Spirit, promised by Christ when he ascended to Heaven, gave them the power of miraculous words, of expressing the news of God’s coming among men to those who spoke in other languages. This was a practical gift. As a reversal of the dispersion in Babel centuries earlier, here in Jerusalem, the people are brought together. How does God bring us together? How do we share, console, encourage, love? Through words. Through action and touch, to be sure, but through words, a divine and miraculous form of action and touch. Peter stood up in the midst of the brothers and sisters (there was a group of about one hundred and twenty persons in the one place). He said, “My brothers and sisters, the Scripture had to be fulfilled which the Holy Spirit spoke beforehand through the mouth of David, concerning Judas, who was the guide for those who arrested Jesus. Judas was numbered among us and was allotted a share in this ministry. Pentecost, the Greek word for ‘Shavout’ is an ancient feast in Israel that celebrates the harvest and giving of the Torah on Sinai. In the Christian liturgical calendar, Pentecost, observed 50 days after Easter Sunday, marks the end of the Easter season and celebrates the descent of the Holy Spirit upon the apostles and other disciples of Jesus. 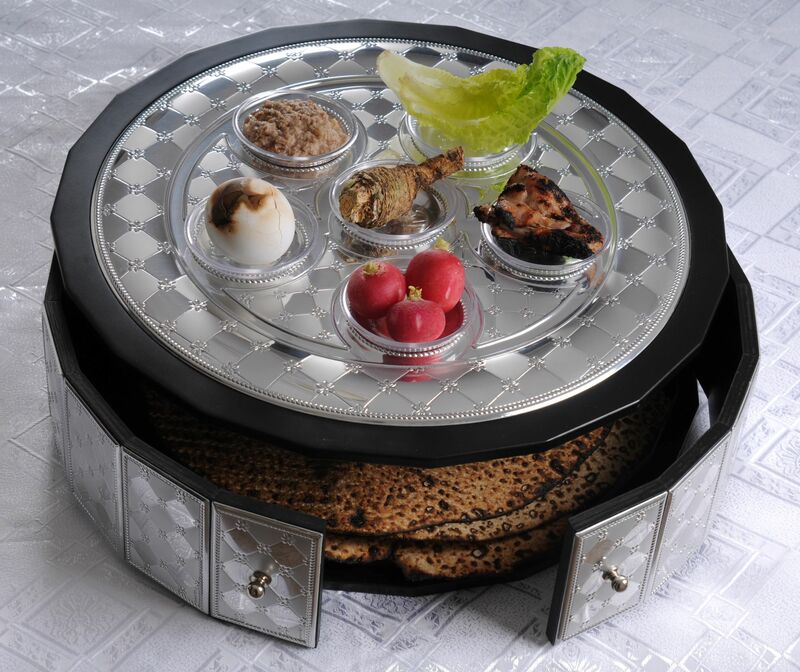 There were three major feasts that the nation of Israel had to celebrate: Pesach (Passover), or Unleavened Bread; Shavu’ot, or Pentecost (also known as the Feast of Weeks, or Feast of Harvest); and Booths (also known as the Feast of Tabernacle, or Ingathering). There isn’t a single person who could honestly tell you that they haven’t struggled with doubts, a single person that could tell you they haven’t sinned, and fallen away, and had to come back. Act 2:21 And it shalt come to pass, that whosoever shall call upon the name of the Lord shall be saved. “Whosoever,” be he Jew or Gentile, “shall call upon,” &c., embracing the Christian religion—“shall be saved” from ruin here. If it refers to the siege of Jerusalem, it was literally fulfilled in the case of the Christians, who by Divine admonition, fled to Pella, beyond the Jordan before the final destruction of Jerusalem (Eusebius, Hist. Eccles. Lib. iii. c. 5). Not knowing that Jesus Christ’s death would lead to His spirit within them, the Disciples could not understand even throughout all of His teachings and parables. Not until the Holy Spirit entered their bodies, were they really able to understand and grasp the true meaning of their salvation.